A simple starter or plenary slide with six questions on the topic of free time. 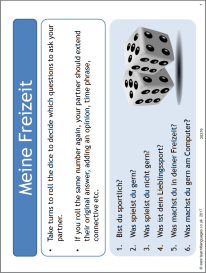 Students roll a dice to decide which questions to ask their partner and are encouraged to develop their answers. This could also be used for GCSE revision.